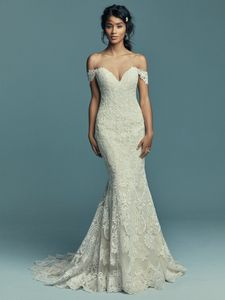 Description: Elegant and romantic, this soft fit-and-flare wedding dress features allover lace motifs atop tulle, completing the strapless plunging sweetheart neckline. Lined with shapewear for a figure-flattering fit, and finished with covered buttons over zipper closure. Illusion off-the-shoulder cap-sleeves accented in lace motifs sold separately. Detachable tulle train accented in lace motifs sold separately.